Baldassarre Orsini (1732-1810) is considered a real protagonist in the cultural, artistic, scientific and literary life of Perugia and beyond. 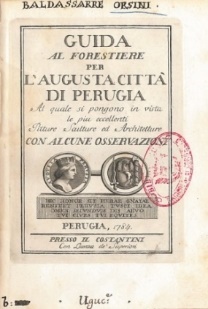 An analysis of Orsini and his works allows one to draw a significant cross-section of the second half of the Settecento in Italy. 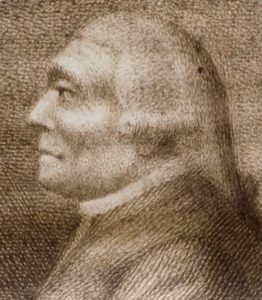 He lived mainly in Rome (starting in 1751) and in his native Perugia, where he returned permanently in 1779 and became the Director of the Accademia del Disegno (Academy of Drawing) in 1790. He was a “painter-philosopher” (as he was re­membered at his death), but also an architect and scholar. The exhibition, following in the wake of the show held at the National Gallery of Umbria, is a continuation of the focus on Baldassarre Orsini, a true leading figure of Perugian cultural history. The Fondazione Ranieri di Sorbello will also organize a series of conferences up through March 2018. 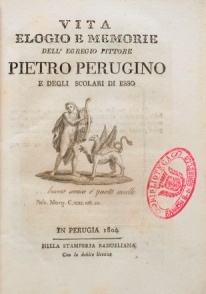 The elegant 1784 first edition of the famous Guida is considered one of his most noteworthy works on art and a benchmark among the art guides of that period on the town of Perugia. A gift from Guglielmo Orsini to Ruggero Ranieri Bourbon di Sorbello (1927). Autograph manuscript (about 1800). 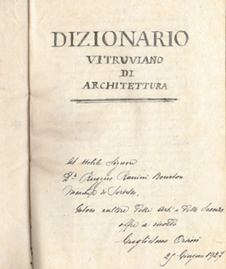 Slips of paper regarding whole entries or additions to some of them are inserted in the text, providing evidence of Orsini’s continuous revision of his works. In this work dedicated to Perugino, Orsini defines the outstanding painter as a “modern” artist, as he fully uses, as Professor Bruno Toscano says,“the canons and mastery of modern painters”.